LONDON, England (CNN) -- -- Formula One is currently being torn apart over a row concerning next season's proposed $60 million budget cap. 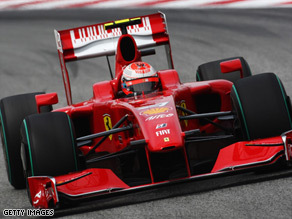 Ferarri are set to boycott the 2010 Championship unless proposed rule changes are dropped. The sport's world governing body Federation Internationale de l'Automobile (FIA) wants teams to sign up to the agreement for the 2010 season but has met resistance from Ferrari and other leading constructors who claim it will create a "two tier" championship. In a bid by the FIA to survive a "harsh recessionary period" the body published plans on its Web site to ensure "a healthy grid by cutting costs." To achieve such aims the FIA proposes a "capping" system whereby teams spending less than $60m -- including driver salaries, marketing and engine costs -- would have fewer technical restrictions than those who spend above this figure. The plans to implement the new rules next season has proved divisive among constructors on the grid, so much so that now the whole future of the sport in its current form is in doubt. Deadline looming ... Entries for next year's championship officially open on May 22 with a final deadline of May 29 so the need to find a solution is imperative. Before the threat of pull outs by established teams, the 2010 grid looked set to be larger with an new American team USGP, based in North Carolina, announcing earlier this year that they would compete.